Christmas and New Year in France is traditionally the time for oysters or huîtres with about 50% of the annual oyster production being consumed during the festive period. According to tradition, you can eat oysters any month of the year providing it has an 'r' in it, as from May to August the increased heat means they are not at their best, or rather to some tastes as some people don't like the creamy egg sac. 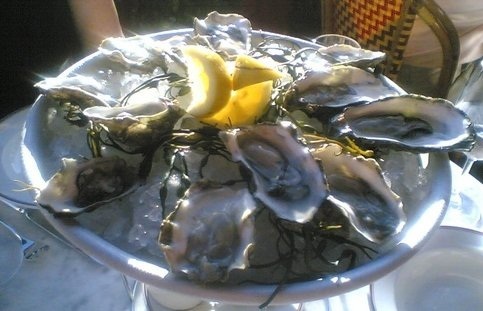 Nowadays, you can buy oysters that have been sterilized, called "huître triploïde", these can be eaten all year round since they never have an egg sac.The charming coastal village of Bouzigues with its stretching oyster beds is famous throughout France for producing the finest oysters and is responsible for about 10% of the oyster production. 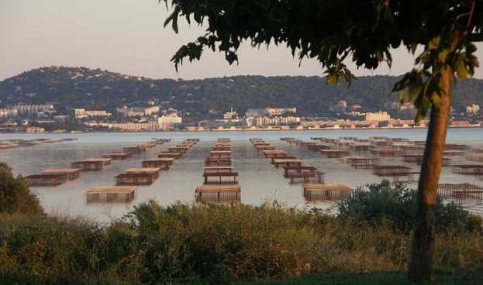 If you are in the area it is worth making a detour to visit the coastal villages of Bouzigues, Mèze and Marseillan along the edge of the Etang de Thau, where you will find many producers selling seafood caught that morning. They have charming restaurants where you eat their products - it is impossible to get seafood any fresher than this! Served hot or cold with bread and wine, it's absolutely delicious. Connoisseurs will open them up and squeeze a little lemon juice on them. This causes the oyster to shrink or quiver demonstrating its freshness, ie, that it is still alive. Others liberally sprinkle shallots, red wine vinegar and a dash of Tabasco. If you don't like the idea of swallowing one of these things whole, which is la mode, then you can gently heat them under a grill with a dash of champagne. You can go the whole hog and smother them in bacon bits and cheese and then stick them under the grill au gratin (which rather masks the taste of the actual oyster but some would probably think this is a good idea). If you want to prepare them in the traditional way for Christmas then follow the recipe here. However you eat them, they are best washed down with a chilled white wine. The most popular choice in the Languedoc-Roussillon is a cold Picpoul de Pinet. Grown on the panoramic limestone plateau near Sète, the cooling Mediterranean sea breezes protect the grapes from the heat of the day and provide much needed moisture. The wine is remarkably fresh and citrus and gets its name from its Occitan origins translating to 'lip stinger'. See our wine review on the Carte Noir from Cave de l'Ormarine whose vineyards overlook the oyster beds below.